Want to make this Christmas special? Decorate your home with fun and exciting Holiday decorations. 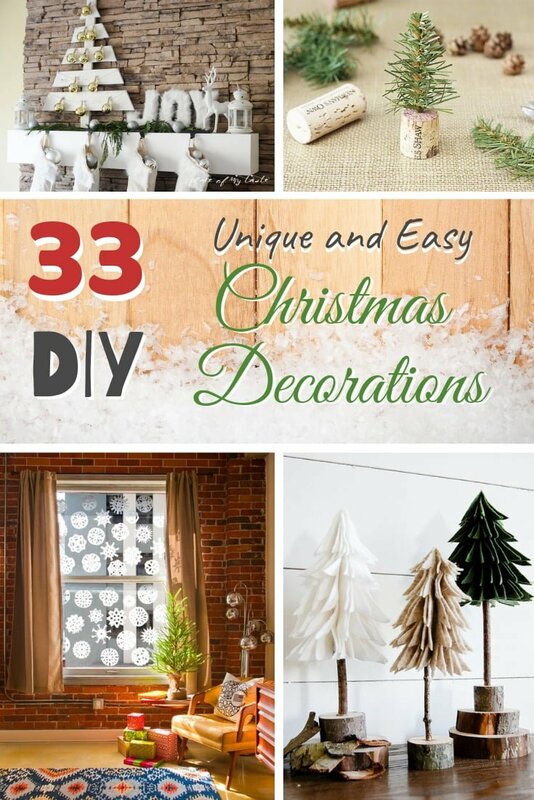 Here are 33 genuinely unique DIY Christmas decor ideas that will help you. It’s that time of the year again when we go all in decorating our homes for the holidays. We all want to create an amazing Christmas experience for our family, and we will stop at nothing to do that. So, up go the garlands, toys and ornaments, snow globes, fairy lights, and Christmas trees. To be truly unique this year we invite you to think outside of the box and get inspired for something out of the ordinary. And while traditional decorations are necessary, your home will be exceptionally festive with some of these easy DIY Christmas decor ideas. There is nothing better than producing a DIY holiday decoration that looks like it took months of slavish detail work to complete but got whipped together in an hour or two. This is just so seemingly delicate and yet intricate at the same time that even you will have trouble believing that its DIY rather than picked up at some trendy boutique. You don’t have to tell unless you want to. Now here is an idea that is super smart and so environmentally friendly. We all love those kitschy Christmas gift bags. Here is a way you can pair them up with an old picture frame and turn them into a strikingly original wall decoration that will have everyone talking. We all know that it can’t possibly be Christmas until there is at least one styrofoam ball in the shopping bag. For these adorable mommy and daddy snowmen, you’ll want to get at least six. More if you wish to make baby snowmen too. Candy canes are a perennial favorite for home holiday decorations. You can practically smell the peppermint just by looking at the pictures on this one. Simple, thrifty and, who knows, it might come in handy if that new dessert doesn’t turn out quite right. Everyone loves those welcoming and cheery Christmas wreaths on the door. They set the tone for what is about to happen once your guests get into where it is warm and toasty– plus they are such an easy addition to your holiday ensemble. Here’s a delightful little touch for your guests to look at as they take off their winter things in the foyer. It’s so whimsical. Everyone will want to know where you got it from, and you can answer by tapping yourself on the heart. Speaking of beautiful and unique decorations in small packages, you’re going to want a couple of these DIY snow globes for the kids to play with — if the adults ever get tired of them. Maybe you better make some extras so everyone can share in the fun. Less is a lot more when you make these fabulous inverted wine glass dioramas for your sideboard or table. Three different wine glasses, sugar, and adorable little figurines are all you need to produce a charming touch of the season in a minimal space. Fire up your glue gun again for this scrumptious three-color berry wreath with just the most delightful hint of greenery peeking through the abundance of berry sprigs formed around a wicker wreath. So easy to make and so wonderfully welcoming and different. Everybody has tons of old Christmas Tree bulbs lying around. Why not turn them into something completely different this year and use them as the foundation for a captivating and symmetrical centerpiece for your holiday table? Part of the true joy of Christmas lies in exploring the many different ways in which it is celebrated around the world. Here is one from Ukraine that you’ve probably never heard of before – a Christmas Spider hiding in the tree. Made from leftover beads and wire, you can add a touch of surprise and mystery to your tree this year. How about some Pretty Quirky ideas for having more fun with ornaments? Just string a bunch of your favorites onto lengths of ribbons and drape them in carefully chosen ways that will display this creative new twist on an old decorative favorite. Who doesn’t love holiday candles? Needing only a package of half round glass stones and a glue gun, this safe and enchanting candle holder is so easy to make. As soon as it is finished, you’ll be dying to turn off the lights and let the candle flames reflect and dance through the stones. What would a do-it-yourself holiday season look like without Martha Stewart in it? We don’t know either. Check out her candy cane wreath for something that is quick and easy, but you’ll need to display it in a dry location. This charming collage of snowflakes is not just about Christmas but can even start early and go all the way till the snow begins to melt. A simple assortment of Dollar Store snowflakes and a glue gun that is ready to rumble is all you need. Frosty Meets The Snow Globes in this ridiculously-easy-to-make snowman that features inexpensive acrylic fishbowls filled with fluffy white cotton wool snow and cheery holiday figurines arranged in three separate vignettes. You’ll be so tempted to give it a shake. But please don’t. Here’s a beautiful and tastefully understated Santa Wreath to hang on your door. With Santa’s jolly hat, a wreath form, a spool of lovely white tulle, and some snips of ribbon, you can make this uniquely evocative wreath that will become one of your cherished favorite traditions for years to come. Crazy as it sounds, these are really amazingly cute little decorations that are made out of chrome-plated plastic spoons, a styrofoam cone, and (everyone’s favorite) a magic wand with a star on the end. These pass one of the most important tests of any DIY decoration project — you can’t tell what it’s made of unless you look hard. It’s effortless to glue together a snowflake from popsicles, and you get a unique Christmas decoration in modern style. It’s a fun little project that you can engage your whole family in too. Garlands are always fun, and they are a necessary classic. Making them is not still that simple so here’s a tutorial for you. Fun, creative and very Christmasy. 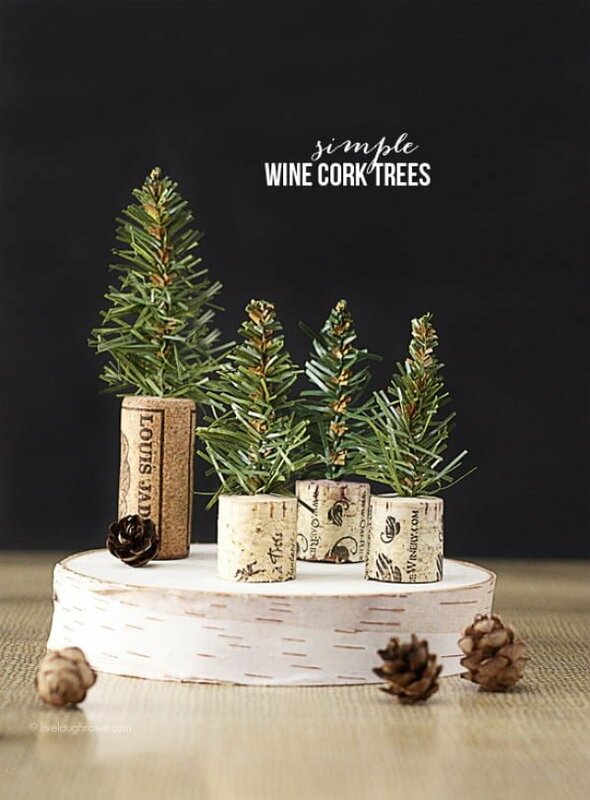 Use any wine corks you have for small Christmas ornaments such as these lovely little trees. It’s a simple display but it will make your Christmas decorations just a little bit more unique. String lights are classic but who wants to limit themselves to standard garlands. Improve your Christmas lights by using colored burlap to create beautifully lighted garlands. Making a Christmas wreath is a lot easier than you think if you know a trick or two. Here’s how you can make a beautiful and very easy wreath by using the wire hanger. Those paper snowflakes in the window are so lovely. Here’s how you can make this craft even better by using coffee filters to make them. You can find a lot of brilliant ideas in stores and catalogs for Christmas decorations. These lovely felt trees are on Target and here’s how you can make your own (and have fun while doing it). If you like modern Christmas decorations and minimalist style, you’ll love this glamorous garland wreath. 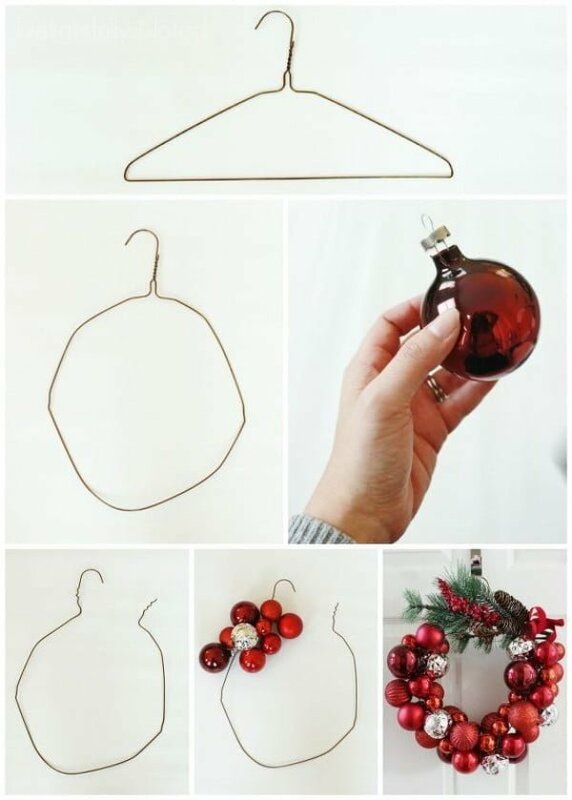 So very simple to make and such a high impact on your Christmas decor. We need lots and lots of fake snow in our Christmas decor. Usually, it’s wool that we use to create it. Here’s another accent for displays – white fur letters. This may be a tiny Christmas ornament but its very cute. 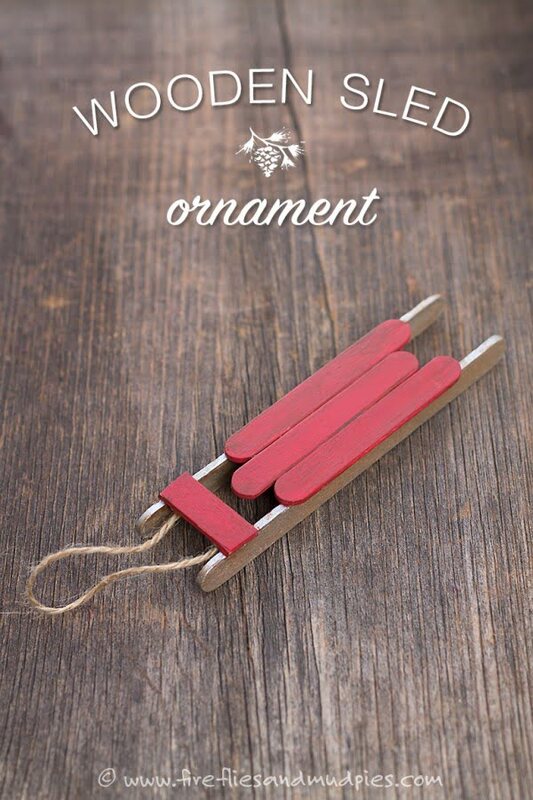 Make it from popsicles for your Christmas tree or any festive display. 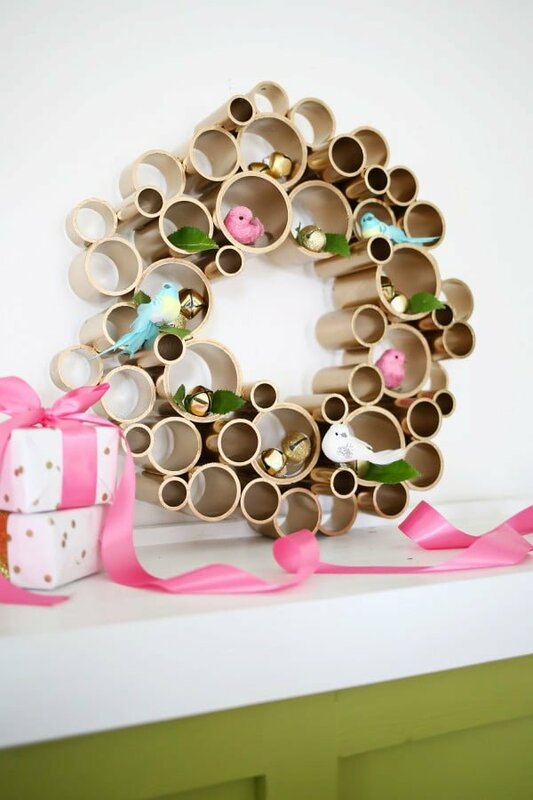 If you like to be different and unique in your decorations, try this PVC pipe wreath idea. It’s an excellent modern approach to contemporary Christmas decor. Here’s another way to make string lights more beautiful. Make these cute little cubes from paper. Follow the step by step instructions in the tutorial. Some ideas are so straightforward, yet they make all the difference. 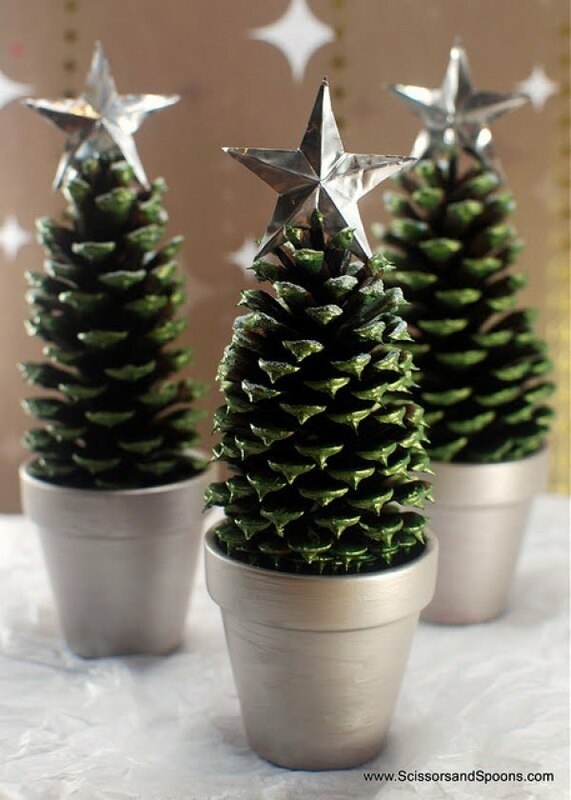 So does this pine cone Christmas tree idea. Alternatively, you can decorate each little tree to your liking with miniature ornaments. 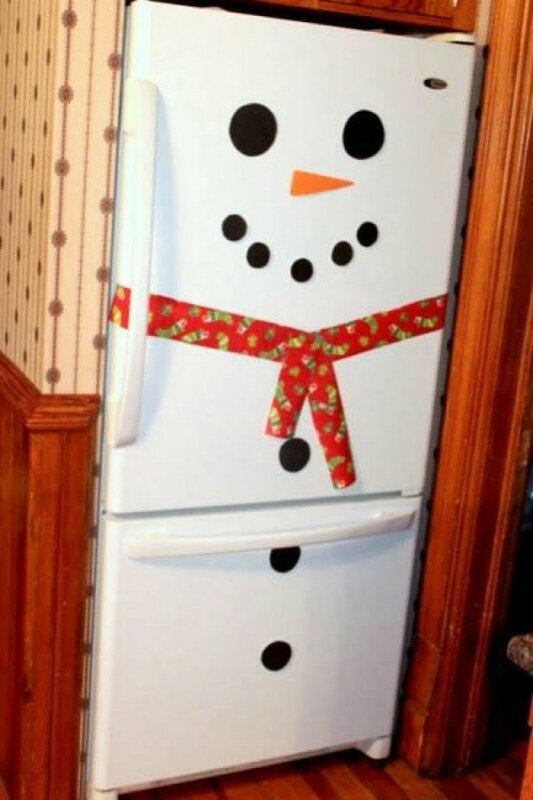 Have you ever noticed that your white fridge already looks a bit like a snowman? Make it a proper snowman by decorating it for Christmas – it’s a straightforward yet fun thing to do. Chances are you’re going to use tea lights in your Christmas decorations. 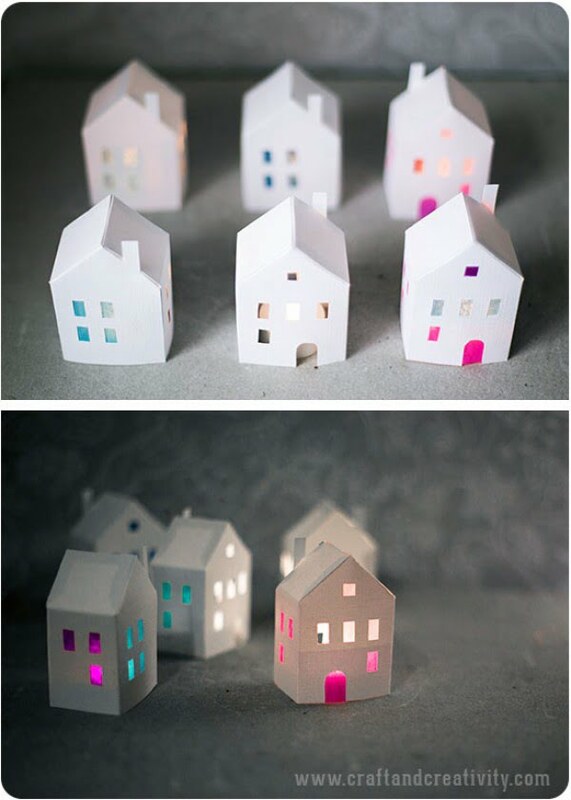 Make it special by creating little paper houses for your displays.